Yeah, at this price, the Fall Line better score top marks in every category. While the neoprene wrist cuffs kept pow off my hands and the seams were on the outside (better for gripping my ski poles while huffing up and breaking trail in the backcountry), it was the fit that made me fall in love with the Fall Line. The articulated fingers hugged mine, making it easier to tinker on skis. As it turns out, they’re great gardening gloves as well and the Fall Line was the only model I could wear to perform tasks requiring fine motor skills, like locking and unlocking my roof box and picking individual strands of Bermuda grass. They were also notably more comfortable than the other two pairs, thanks to the superb breathability and Bemberg lining, which is a natural polyester comparable to silk. …It takes expensive material and craftsmanship to make a glove that interacts with your hand as well as the Fall Line. If there’s a chance you might use a rope or an ice ax, having a glove with that kind of dexterity is nonnegotiable. Made of soft, supple cowhide aniline with outseams for increased comfort and superior pole grip. Hestra Army Leather Patrol Glove With a classic look, these leather-palmed and fabric-backed gauntlet-style gloves are ready for years of heavy use and abuse. A removable liner glove adds warmth and versatility. Buy Now! Hestra Army Leather Patrol Mitt Bottom Line: “A trusty mitten for frigid days or a reliable pair to toss in the pack in case of emergency.” Buy Now! 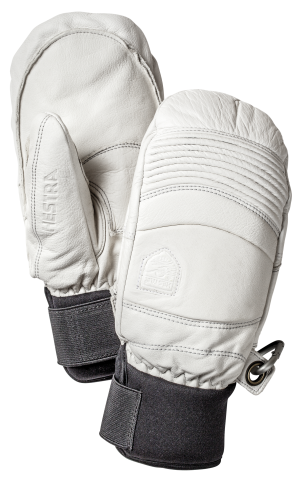 Hestra’s Fält Guide Gloves are extremely durable, boasting 100% leather and removable liners made from terry cloth and wool pile – and you can even swap in other liners of your choice! Your hands and digits will thank you for treating them to some of the world’s finest mitts. If you want the warmth of mitts but hate the clumsy feel, these are the solution. Plus, they are ultra durable and comfortable. The Heli Ski is a superb glove, and I am thrilled with them. I would highly recommend them. Like what you saw here? Was This Article Helpful? Follow us on Social Media and Subscribe to our Newsletter. Which Colltex Skins are right for you? Backpacks For Women – Lifestyle, Travel, Hiking & more.